Saving the planet, one carbon molecule at a time. Imagine a vending machine that dispenses candy at a low price in the morning, but charges more for the same product in the afternoon. You would tend to make purchases in the morning, wouldn’t you? For those of us who pay for electricity based on demand, the grid is like that vending machine. We take advantage of the price differences by doing laundry, running the dishwasher, and using other appliances during those hours when electric rates are low. We ease up on heating and cooling when electric rates are high. Although we make an effort to use electricity as efficiently as possible, our appliances don’t always cooperate. My refrigerator, for example, tends to go through its “defrost” cycle when electric rates are high. The energy consumption of my refrigerator while in defrost cycle is three times as high as when the refrigerator is running normally. Short of rewiring my refrigerator for manual defrost, there doesn’t seem to be much I can do about it, but that may soon change. Soon we’ll be able to buy “Smart” appliances. My refrigerator, for example, will no longer switch to “defrost” mode when electricity is expensive. Additionally, temperature settings could be adjusted upward slightly when electric rates are high, and lowered when rates go down. Because these changes will be small, you’ll save money without jeopardizing the contents of your fridge. Signals from the utility company will trigger the setting changes. Smart appliances do more than cut your electric bill, they also benefit electricity providers. They reduce the peak demand, resulting in less strain on the power grid. With widespread use of smart appliances, slight adjustments to each one would result in a significant demand reduction system wide without a noticeable change at your home. Most people, I suspect, won’t rush out to buy new appliances just to take advantage of this technology. You’ll probably wait to replace your refrigerator, dishwasher, washing machine, dryer, air-conditioner, and other appliances until a product failure creates a need. The first smart product you might buy, and perhaps the most useful of all, is an “In-Home Display”. 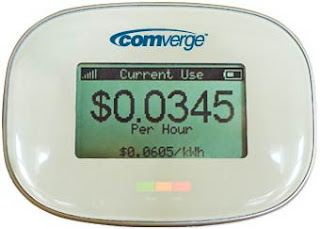 This device receives real-time rate and consumption data from your electric meter. Not only will you know the exact cost of electricity at any time of the day, a quick glance at the color-coded display tells you if rates are low, medium, or high. With this device, you’ll know the best time to run the dishwasher and other appliances. You’ll know when it’s advantageous to cut back on the air conditioning a bit. Enable a battery charger when electric rates are low. Enable supplemental heating when electric rates are low. Pump water when electric rates are low. Disable non-critical electrical devices when electric rates are high. Charging batteries while rates are low would provide you with stored energy that could be used when rates are high. Supplemental heating could lower overall heating costs by limiting the amount of time the primary heater runs when rates are high. Water pumping could be enabled when rates are low, minimizing the need to pump water when rates are high. Smart products, like the ones described here, are built around “ZigBee” technology. ZigBee is a wireless control technology that offers product manufacturers and developers the ability to build reliable, cost effective, low-power wireless control products. The ZigBee Smart Energy Profile was completed in January of 2008. A product achieves ZigBee Certified Product status after successfully passing certification testing. In addition to display units, ZigBee Smart Energy Thermostats are available at the time of this writing, and smart appliances should be available sometime next year. It is important to note that for Smart Energy products to work, you must also have a “smart” electric meter. My meter was installed when I enrolled in Ameren’s Power Smart Pricing program. This technology will not be limited to communications and appliance control. V2G is another application of ZigBee technology that will someday benefit the consumer as well as the utility provider. I checked out the display sites...very cool, thanks for posting. In your opinion, which are the best in terms of quality and function?? Thanks - Interesting how they don't work. I just sent an email to PSP myself - equipment like this would be helpful and convenient. I follow your blog for a long time and must tell you that your posts always prove to be of a high value and quality for readers. Keep Sharing. Thank you Mehreen. Comments like yours keep me motivated. This is a good common sense article. Very helpful to one who is just finding the resources about this part. It will certainly help educate me. after browsing a lot of crappy blogs today, thisone really sticks out from the crowd! I've installed 595 watts of PV. Batteries will last longer if they are not discharged more than about 20% of their capacity. Deep discharging should be rare. This implies that a battery bank is properly sized if it is about five times the daily load. This shows how much SJ is paying per kwh for electricity right now. Rate changes hourly. "For years, everyone thought Noah was paranoid & crazy ... until it started raining ..."
Interested in PHEV's? Here's a video you'll like. Fixtures that trap heat inside, like this one, shorten CFL bulb life. Rotating the fixture 180 degrees helps to keep the CFL electronics cooler. It's been more than 12 months since I've rotated this fixture, and I've had no burn-outs. What have you done for the earth today? Acid Mine Drainage Site Tour. Near Carbondale Illinois. 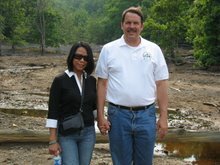 Seepage from an abandon coal mine caused the "dead zone" you see behind me. Cleaning it up is just one of the costs of burning coal to produce electricity. Clean Coal is an Oxymoron! "If you can't measure it, you can't control it." Kevin Donovan, Data Center Manager, NREL, Golden CO.